Make certain that your offices, hotel, restaurant, health spa, school gym, social club and other public spaces comply with laws and regulations requiring that you have AEDs available. A quick response to the onset of a heart attack is absolutely crucial to help prevent sudden cardiac death or neurological damage. Place AdirMed non-alarmed AED cabinets in key locations at your facility and provide your staff with instructions on using AEDs. These cabinets will accept most commonly used AED devices. QUALITY CONSTRUCTION. Made using sturdy steel construction to supply long-lasting strength and use, the AdirMed is built to last for years to come. The material is also easy to clean, simplifying maintenance and housekeeping jobs. UNIVERSAL DESIGN. Measuring 15" H x 15" W x 7" D in size, this cabinet is designed to accept most commonly used AED devices. It's clearly labeled in bright red and furnished with a large window for easy contents identification wherever it's placed. QUICK ACCESS. A quick response to the onset of a heart attack is absolutely crucial in helping to prevent sudden cardiac death or neurological damage. The AdirMed is outfitted with a single-handle, pull door latch, allowing for quick access to the AED in an emergency situation. VERSATILE USE. To comply with the laws and regulations requiring that you have AEDs available, place AdirMed Non-Alarmed AED Cabinets in key locations at your facility. They are essential additions in an office, hotel, restaurant, health spa, school gym, social club and other public spaces. EASY INSTALLATION. 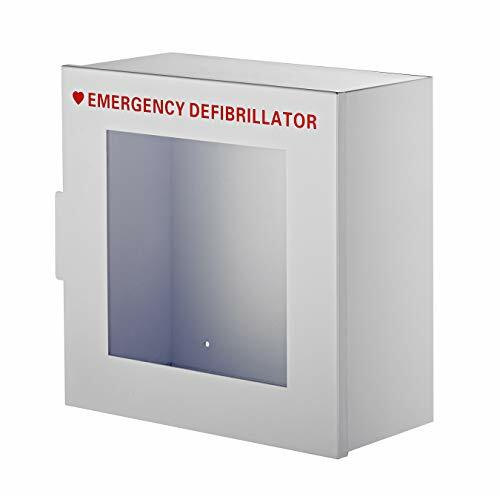 The AdirMed Non-Alarmed Steel Cabinet for Defibrillators is outfitted with pre-drilled holes and comes complete with screws and anchors for easy mounting onto any wall. If you have any questions about this product by AdirMed, contact us by completing and submitting the form below. If you are looking for a specif part number, please include it with your message.